No it is not. There are several vitamers or forms of vitamin D and one of them is also vitamin D3. So vitamin D is a name for a complex of D vitamins also known as calciferol while vitamin D3 is individual vitamer, also known as cholecalciferol and it is the active form of vitamin D in the human body. There are actually 5 forms of vitamin D (D1-D5) but two forms of vitamin D are most important and those are: vitamin D2 or ergocalciferol, and vitamin D3 or cholecalciferol. It should be known that vitamin D without a subscript also refers to either D2 or D3 or both. So, Vitamin D is sometimes referred to as calciferol, but it’s used as an umbrella term to include vitamins D-2 and D-3. Vitamin D2 is the form of Vitamin D made by mushrooms after sunlight exposure. Vitamin D3 is the type of vitamin D that is made in human skin. Both types have to be transformed into the hormone calcitriol before they become to function and be able to benefit the body. 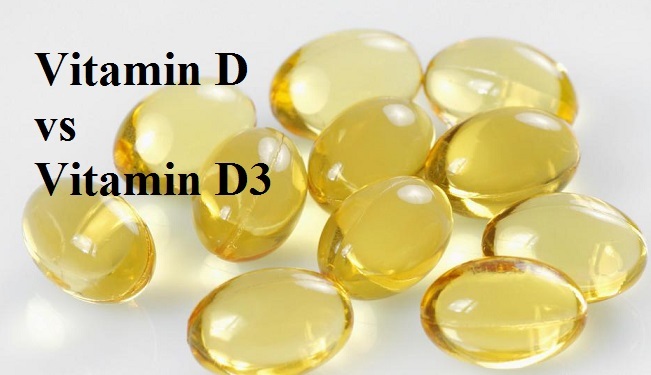 Vitamin D2 was first chemically characterized in 1931 while Vitamin D3 structure was identified in 1935. Both forms can be also manufactured in the form of supplements. Vitamin D3 that is made from sheep’s fat lanolin is more commonly used. Vitamin D1 is a mixture of ergocalciferol and lumisterol in 1:1 ratio. Vitamin D4 is found in certain mushrooms, it is also known as 22-Dihydroergocalciferol. Vitamin D5 also known as sitocalciferol is derived from 7-dehydrositosterol. Analogues of Vitramin D have been proposed for use as antitumor agents. When your skin absorbs ultraviolet rays from sunlight, it produces a substance called pre-vitamin D-3, which then travels to the liver where vitamin D3 or calcidiol is made. Special carrier proteins then transport calcidiol to the kidneys, where it’s turned into vitamin D’s biologically active form, calcitriol. The amounts of vitamin D3 that is produced by your body depend on how much your sunlight exposure and factors such as cloud cover, clothing and use of sunscreen may have an influence. Studies found that sunscreen with an SPF factor of 8 reduce the vitamin D amount that body produces by 95 percent. But, in order to prevent skin cancer it’s still very important to limit your sunlight exposure, and you’ll need to get some vitamin D in your diet. Vitamin D is considered as a hormone and it is not really a vitamin. Vitamin D regulates the absorption of dietary calcium. Without adequate amounts of vitamin D in the body, it wouldn’t be matter how much calcium you take from foods and you will certainly have low levels of calcium. By promoting absorption of calcium in the intestinal tract, vitamin D also promotes bone resorption by increasing the number of bone cells known as osteoclasts, but also regulating calcium and phosphate levels for bone formation, and it also has effects on proper functioning of parathyroid hormone to maintain serum calcium levels. Vitamin D deficiency will result in lower bone mineral density thus increasing the risk of reduced density of bones and may provoke osteoporosis or bone fracture because a lack of vitamin D alters mineral metabolism in the body. Vitamin D is also very important because it regulates cell growth, including cells that activate immune response to fight bacteria. Recent studies suggest that vitamin D may be helpful in a prevention of cancer and lowering blood pressure. Since you can never be certain how much of vitamin D your body makes from sunlight, you should include 15 micrograms, or 600 IU, of vitamin D in your daily diet. What are best food sources of vitamin D and vitamin D3? Vitamin D can’t be found in most foods, which is why milk is fortified with 100 IU of Vitamin D per cup. Other types of dairy products may be enriched with vitamin D, however for some products enrichment is not required. The best natural sources of vitamin D are fish, especially salmon and trout, with approximately all the recommended daily value in a 3-ounce serving. The same portion of canned tuna, halibut and rockfish has 156 to 229 IU. Large egg contains about 44 IU of vitamin D. The vitamin D in mushrooms differs because some species are more exposed to ultraviolet light to increase the amount. In general, there is no enough relevant evidence that supports belief that vitamin D supplements can help preventing osteoporosis. But, for older patients with osteoporosis, taking vitamin D with calcium may help in prevention of hip fractures, but there is also slightly increased risk of stomach and kidney problems. It has been claimed that vitamin D has anticancer properties. It is still unclear, however, if taking additional vitamin D as supplements or in diet reduces the risk of cancer and especially colon cancer. A 2014 review found that supplements had no significant effect on cancer risk. But, there are some evidences suggesting that hypovitaminosis D may be associated with a worse outcome for some cancers. There are no positive or enough relevant studies that confirms the claims that vitamin D may reduce the risk of stroke, cardial infarction, cerebrovascular disease or ischaemic heart disease. Supplementation of vitamin D has no effect on blood pressure also. One systematic review of clinical studies found connection between low vitamin D levels, cognitive impairment and a higher risk of developing Alzheimer’s disease. Deficiency of Vitamin D has been linked to increased risk of viral infections, including HIV and influenza but also tuberculosis. Some data found link between low levels of vitamin D and asthma, however bigger studies are needed to confirm that. Low levels of vitamin D are associated with higher risk in patients with Crohn’s disease and ulcerative colitis. Further investigation is needed to confirm that finding. Low levels of vitamin D in pregnancy may be related with gestational diabetes, pre-eclampsia, and small infants.